The green one looks like a space creature. And the other one is huge. actually both are pretty big. 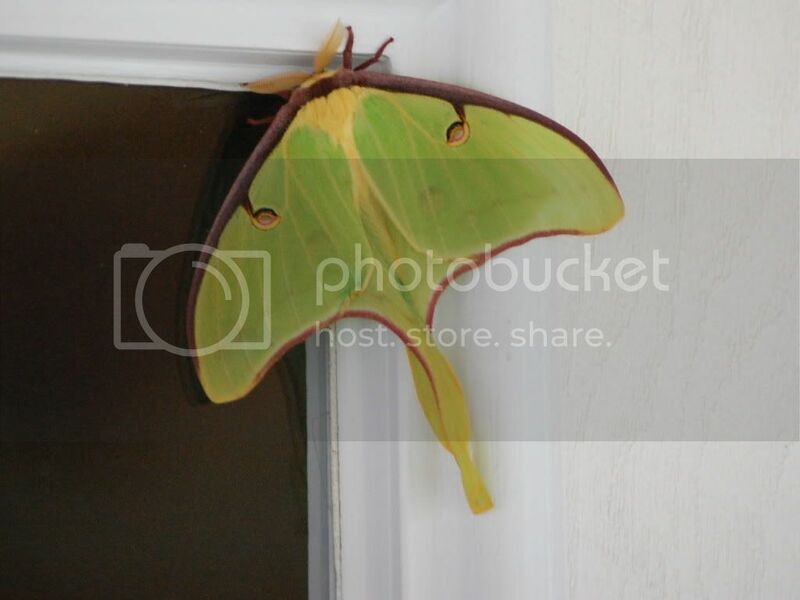 The first one is a luna moth. Does it bite? Doesn't Luna mean moon?? See I knew it was from outer space ! I thought maybe the second one was some sort of moth. They primarily come out at night. Luna does mean moon and they are other worldly aren't they? I don't see them often, but I think they are pretty. Yep to both. The second one is a female, male angulifera is a different color. Both are silk moths. Cecropia is also pretty common if you're out in the sticks, they're huge, make lunas look petite by comparison. The Luna moth will not bite. Sadly, it has no mouth. It's lifespan is a week or less, so no need for eating. After fighting those little gray ones that zoom into the house all summer, it's amazing to see the really, really large ones. 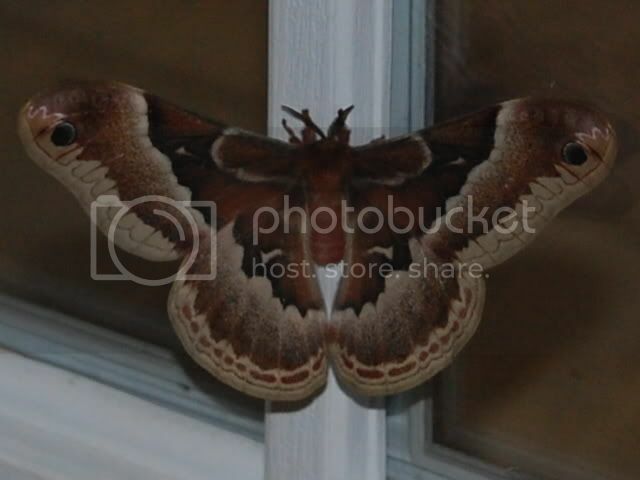 I've grown moonflower vine in the past and late at night there's are giant moths (same coloring as no. 2, but diferent body shape) which hover around the flowers like hummingbirds. They feed like hummer also with an approximate 4-5 inch proboscis extending deep into the lower for the nectar. I hope you all are lucky enough to see this sometime. Thanks. I did look it up last night when I found out what the space creature was and read that they don't have a mouth and only live about a week. It is still on my door this morning. It said that they find a safe place until their wings harden usually a few hours....it has been there since about 10am yesterday. My granddaughter doesn't want to go near it. Where can I get a moonflower vine? Have you heard about the moth that landed on the two-year-old's birthday cake? It burned its end at both candles. lunas are stunning...i love how amazing the camoflage is on them, i mean look at it, its a branch! with buds and everything!